Photographer and sculptor Jason Shulman doesn't watch movies like the rest of us. Instead, he hits play and lets his camera take over. Using ultra-long exposure, the London-based artist can capture an entire movie in just one photograph. For his new series Photographs of Films, on display at London's Cob Gallery until June 4, Shulman has taken 54 full-length films -- from Stanley Kubrick's "A Clockwork Orange" to Italian classic "Life Is Beautiful" -- and flattened them into eerie single shots. In his photo of Disney's 1951 film "Alice in Wonderland," you can make out Alice's hair and dress in the ambiguous shapes and patches of bright color. Photographing James Cameron's fast-paced cinematography in "Avatar," resulted in a uniform slab of plain blue. And when Shulman condensed "2001: Space Odyssey" into a single frame, it appeared divided into three, reflecting the film's iconic three-screened council room. The results are unpredictable. Some of the photographs appear to have little in common with the films they represent. But Shulman wants viewers to see the works in their own way. "People bring their own theme to the party," he says, "just like reading shapes in a cloud, they see what they want to see." 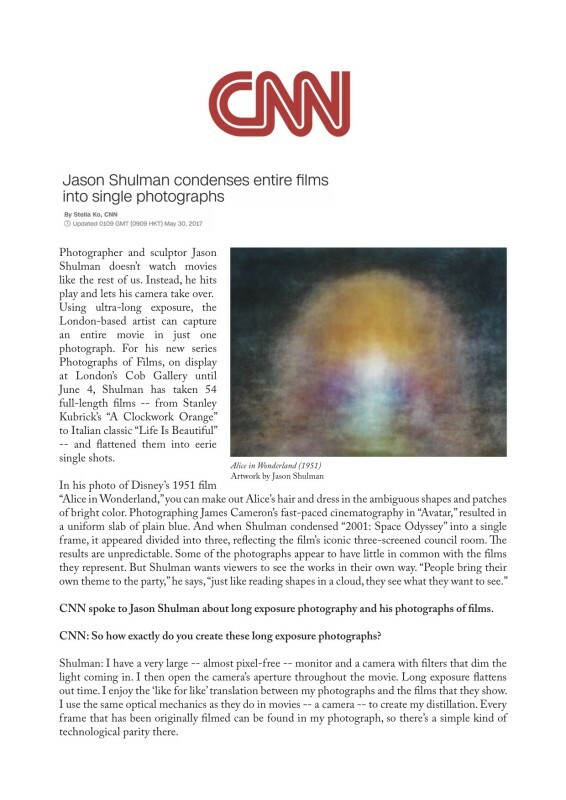 CNN spoke to Jason Shulman about long exposure photography and his photographs of films.